This article is an examination of the more commonly used fibromyalgia medications and a few results of recent studies on the effectiveness of the medications in fibromyalgia patients; ways to reduce the cost of your fibromyalgia medication; and appropriate warnings where warranted. Fibromyalgia is complex. Here at “Living Smarter with Fibromyalgia”, we understand that not everyone will walk the same path when it comes to their approach in treating fibromyalgia and all of its complexities. If you are taking prescription medication for your fibromyalgia, we want to be sure that you are approaching your fibromyalgia medication the “smarter” way. If you have had a major surgery in the hospital, you might think that morphine, or other opiates, are your “best friend”. But, did you know that when prescribed for fibromyalgia pain, it helps at first and then slowly turns on us until it actually causes more pain! Studies have shown this to be a fact. When it happens, you may not even know it’s the opiates that are exacerbating the fibro pain; you may even ask your doctor for a larger dose! The smarter approach is always going to be the least invasive with the least negative or toxic side effects. This means you may have to take more personal responsibility when working with your doctor. When you are prescribed any medication, you always need to be thinking "is this the lowest effective dose for my condition?" Building a tolerance to any fibromyalgia medication without the use of other conjunctive therapies is counterproductive because we are not allowing the body to aid in the healing process. And, by healing process, we are not talking about a ”cure” for fibro; no, we are talking about creating greater levels of wellness and well-being while reducing overall pain levels and fibro symptoms. Some of us have been forced to be more creative, due to intolerance to medications and/or belief in holistic methods and modalities of healing. We often use the word “preventative” when referring to a lifestyle that supports less susceptibility to all disease. Yet, preventative measures are simply living the lifestyle in which we were meant to live. Free of toxic medications, free of toxic air, soil, and water and free of negative and toxic emotions. Well, to many that sounds like a perfect world that never existed anyway, at least not here on earth. But in striving to live as close to this “ideal” as possible, we are using the better and smarter approach to fibromyalgia and, as I like to say, “any other illness that may be lurking around the corner”. I have always been very intolerant of medications and had to find other ways to control my severe fibro and chronic migraine symptoms. I spent years working thru symptom after symptom. Also living with CFS/ME, I understand the complexity of these co-conditions and do not take them lightly. Over many years as both practitioner and patient, I had finally reached a point where I had built a “toolbox” containing various methods to control my symptoms. That is really what encompasses this website. This is a complex condition with complex co-conditions, I certainly get that. The point is to avoid putting extra burden on the already vulnerable fibro body. We would never recommend that anyone subject themselves to more pain than can be tolerated. The goal is to use as many non-invasive remedies as possible while trusting in the magnificence of the human mind and body. Yes, even while living with fibromyalgia and all of its complexity. What follows is a list of the more commonly used fibromyalgia medications and a few notes on recent studies on the effectiveness of the medications in fibromyalgia patients; ways to reduce the cost of your fibromyalgia medication; and appropriate warnings where warranted. Constipation or diarrhea, dizziness, dry mouth, headache, stomach upset, drowsiness, sexual dysfunction, blurred vision, confusion, liver and kidney function impairment. 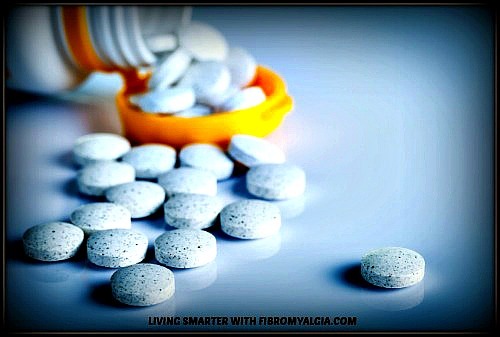 By my count, there are over 30 drugs being prescribed “off-label” for fibromyalgia. I’ve included several representative examples of the more interesting ones to illustrate the variety of fibro symptoms and co-conditions treated, including Restless Leg Syndrome (RLS), Irritable Bowel Syndrome (IBS), Fibro Fog, as well as the key symptoms of fibromyalgia (Pain, Sleep, & Fatigue). if you are taking any serotonin enhancing supplements. SSRIs keep a high level of serotonin in the brain, and any additional sources could cause Serotonin Syndrome, a life-threatening condition. In the above list Amitriptyline, Paroxetine-IR, and Fluoxetine are SSRIs. Also, many of these drugs carry a warning regarding suicide especially for those 25-years old and younger and those with severe clinical depression. I wish I could tell you that there was real help for your fibromyalgia symptoms from some of the drugs currently being used to treat fibro. The truth is that there is little real help with even pain which most of these drugs target. I have reviewed numerous clinical trials written up in scientific journals and the story is mostly the same one over and over. I chose trials with at least hundreds of fibromyalgia patients where a large number were given the fibromyalgia medication being tested and an equally large number were given a placebo (a fake drug). I also looked at “Reviews” done by the Cochrane Library where often times they collected the results of many trials. In these cases the “reviewers” were careful to look for bias in the studies (a large number are funded by pharmaceutical companies) and apply a grade to the quality of the data. This is SOP (standard operating procedure) at the Cochrane Library and for this reason they are known as the “gold standard” of published scientific studies. Only a small percentage of the real test drug group got moderate to substantial relief of pain; however, a slightly smaller number (about 10% less) of the “fake” drug group would achieve the same result, thereby giving an absolute creditable improvement of only about 10%. The number of participants who dropped out due to side effects often approached the number who benefited. For example: Among fibromyalgia patients taking either of two commonly prescribed, FDA approved drugs to reduce pain, 22 percent reported substantial improvement while 21 percent had to quit the regimen due to unpleasant side effects, according to a new Review in The Cochrane Library. This nets out to a “substantial improvement” of only 1% of the test group. As you can see, the placebo effect and side-effects take their toll on fibromyalgia medication efficacy. “Consumer Reports” has always been a guide for me in making purchases; and now they have published a definitive study of fibromyalgia medications, both FDA approved and the numerous “off-label” drugs. And, as is their custom, they evaluate the products and then look at the cost of each and recommend “CR Best Buys” in the interest of cost effectiveness. I love that, and you should too! Their study in the form of a “Quick Glance” and the full study content can be found at Reference  (I provided a link) in the list of References at the end of this article. Be sure you read it. It will set your fibromyalgia medication expectations on the right path (as I’m trying to do in this page of my website) and will probably shock you regarding your cost effective choices. CR encourages wide distribution so you may want to print it for your own personal use. What Do The Study Doctors Recommend? One of the Cochrane Reviews  was a study of two medications. The two medications often prescribed to treat fibromyalgia are duloxetine and milnacipran. Both are listed in the FDA Approved Drugs in Table 1 above. The authors reviewed 10 high-quality studies comprising more than 6,000 adults who received either duloxetine, milnacipran, or a placebo for up to six months. Using a Quality of Life (QOL) scale for fibromyalgia, the studies reviewed reported QOL ratings lower than 15 on a scale of 0 to 100 even among patients on the medications. This is why I earlier said fibromyalgia medication offers little help for fibro patients. Treatment with drugs alone “should be discouraged,” the reviewers added. Instead, the review authors recommend a multi-faceted treatment approach including medications for those who find them helpful, exercises to improve mobility and counseling to improve coping skills. “The medical field does poorly with the treatment of fibromyalgia in general,” says Brian Walitt, M.D., M.P.H., a co-author of the review and an expert in pain syndromes at Washington Hospital Center in Washington, D.C. “Chasing [a cure] with medicine doesn’t seem to work. The people who seem to me to do best sort of figure it out on their own by thinking about things, getting to know themselves, and making changes in their lives to accommodate who they’ve become,” concludes Walitt. Now, what do I want you to take away from the statements of these experts? (Focus on the third and fourth paragraphs). The third paragraph agrees perfectly with the approach I developed over several years to deal with severe fibro symptoms. It has been successful enough to be part of our total protocol on this website, Living-Smarter-with-Fibromyalgia.com, and my facebook pages, ﻿﻿﻿FibroFitPeople﻿﻿﻿ and ﻿FibroFitPeople1﻿. The fourth paragraph really echoes our “mission statement” to provide to you a resource from which you can pick and choose what works for you. I try to give you guidance from my own experience to help you on your journey from “fibro victims” to “fibro fit people”. There is one more non-prescription medication which is guaifenesin. Dr. St. Amand in his book "What Your Doctor May Not Tell You About Fibromyalgia" lays out an entire treatment protocol for fibro using guaifenesin. Guaifenesin is commonly available, inexpensive, has no side effects, and does not require a prescription. I have added an article discussing guaifenesin for fibromyalgia which you can read by clicking the blue link. Although I do not personally use guaifenesin, we tried to make the protocol as easy to understand as possible for those interested. Walitt B, Urrútia G, Nishishinya MB, Riera Lizardo RJ, Cantrell SE, Häuser W. Selective serotonin reuptake inhibitors for fibromyalgia syndrome. Cochrane Database of Systematic Reviews, Published 5 June 2015. Busch AJ, Barber KA, Overend TJ, Peloso PMJ, Schachter CL. Exercise for treating fibromyalgia syndrome. Cochrane Database of Systematic Reviews 2007, Issue 4. Art. No. : CD003786. DOI: 10.1002/14651858.CD003786.pub2. Busch AJ, Webber SC, Richards RS, Bidonde J, Schachter CL, Schafer LA, Danyliw A, Sawant A, Dal Bello-Haas V, Rader T, Overend TJ. Resistance exercise training for fibromyalgia. Cochrane Database of Systematic Reviews 2013, Issue 12. Art. No. : CD010884. DOI: 10.1002/14651858.CD010884.